A job, it seems to me, is a lot like a marriage. 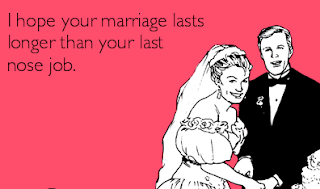 People tend not to congratulate you when you trade your new spouse for a newer model. Yet almost everyone thinks quitting the old job for a new one marks progress of some sort. It shows ambition, imagination, courage and so on. A lasting job should be seen as a sign of success, just as a lasting marriage is. I have come up with my own system for knowing if a job is worth hanging on to. - The work is often interesting. - There is the chance to do different things. - People sometimes say THANK YOU. The reflection on this article leads me to another unfashionable similarity between a job and a marriage. The secret of success lies in reasonable expectations.